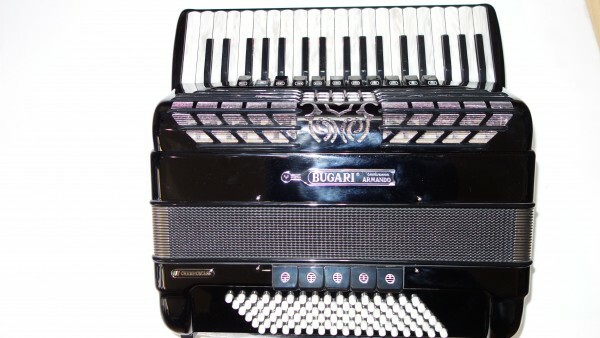 A top quality Bugari Champion Cassotto 96 Bass Accordion, hand crafted in the Italian town of Castalfidardo. 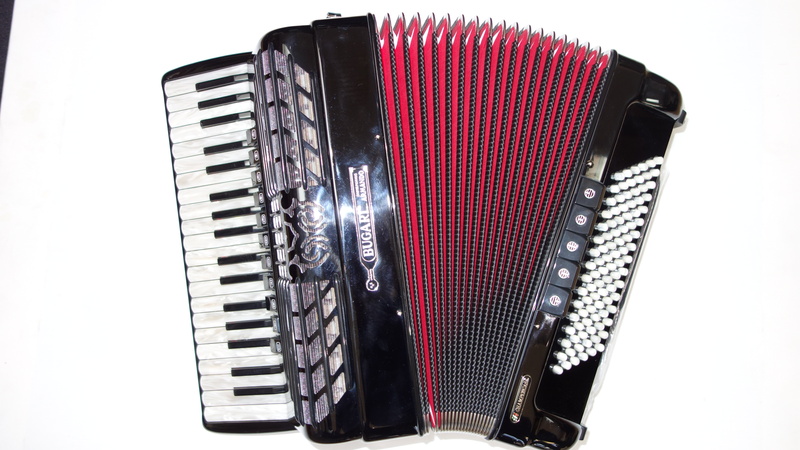 This professional standard accordion, features 96 bass buttons and 37 treble keys, and would be ideal for any players who require a world class tone, action and build quality, but without the larger dimensions and heavier weight of a full size 120 bass 41 key accordion. This Bugari Champion Cassotto 96 Bass Accordion boasts the very best hand made reeds, which are arranged in a four voice musette tuning, making it ideal for the French and Scottish styles of playing. This top end accordion also features double cassotto chambers, on both the eight foot clarinet and sixteen foot bassoon reeds, which help to produce a rich, mellow tone, which is perfect for playing classical and jazz. 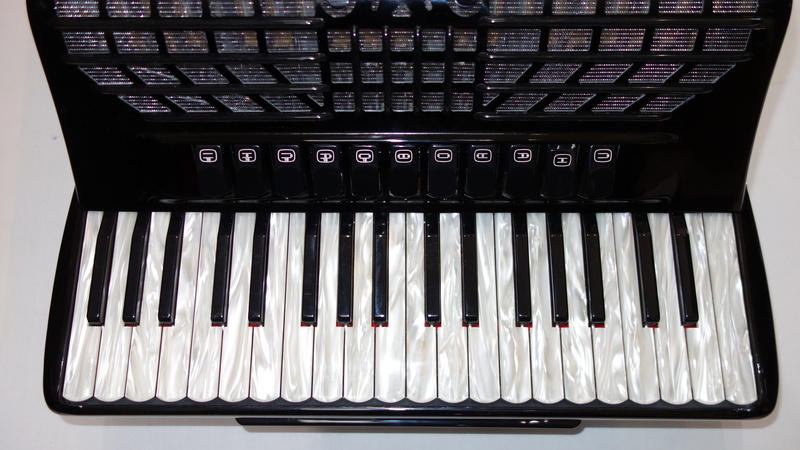 The Bugari Champion Cassotto 96 Bass Accordion is finished in a very attractive high gloss black casework, which is complemented with pearl effect treble keys and bass buttons. 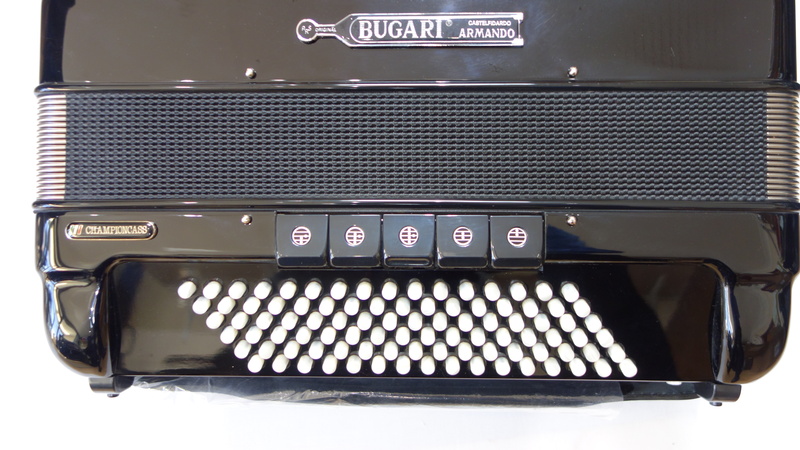 A 0% interest free loan is available on this Bugari Champion Cassotto 96 Bass Accordion subject to status via the Arts Council. Terms and conditions apply, please contact us for full details. This Bugari Champion Cassotto 96 Bass Accordion comes complete with your choice of either a soft gig bag or a hard case, padded shoulder straps and a full five year component parts guarantee. Don’t forget, free delivery of this Bugari Champion Cassotto 96 Bass Accordion to most parts of mainland UK is included in the price! Weight: 9.98 Kg. - 22.4 Lbs.